Chlorine Dioxide - CLO2 Applications within Poultry Processing. Chlorine dioxide is an effective disinfectant that offers an alternative to the standard chlorine that is used within poultry processing in carcass washing applications. Chlorine dioxide possesses broad spectrum anti-microbial capabilities. Chlorine dioxide is not sensitive to system pH. .
Chlorine dioxide is very specific and enters into only a few side reactions when compared with chlorine, it does not chlorinate organics, therefore it does not form THMs. Provides a residual disinfectant level. Chlorine dioxide is significantly less corrosive than chlorine. Chlorine dioxide is 100 - 1000 times more effective at removing/preventing biofilm than chlorine. Chlorine Dioxide Applications Within Poultry Processing. Unloading and shackling → Stunning → Bleeding → Scalding → Plucking→ Evisceration → Carcass Wash → Chilling (Spin Chilled / Air Chilled)→ Sorting→ Packaging. The main problem is to control cross-contamination. 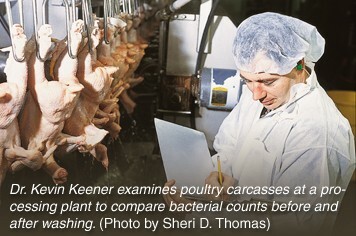 Contamination of carcasses can occur via contact with soiled surfaces, equipment or the hands of operatives. Microorganisms can also be spread in airborne dust particles and droplets and through any rupture of the intestines during evisceration. Chlorine dioxide is best dosed at the various unit processes to act as a break in contamination thereby reducing/eliminating cross contamination as well as removing superficial microoragnisms before they have an opportunity to become attached and penetrate the carcass. Maintenance of a low residual in the scalding tank (0.5ppm). Chlorine dioxide was compared to gaseous chlorine. Chlorine dioxide was substituted for chlorine in the inside-outside washer after evisceration. All other processing was the same for both chlorine and chlorine dioxide. The whole carcasses were collected once they had been air chilled and packaged. Chlorine was between 75 - 100 ppm, and chlorine dioxide was dosed at 3 ppm. Product B = Chlorine Dioxide. The outcome of the case study is that chlorine dioxide at 3 ppm has the same efficacy as chlorine at 75 ppm. The trail was run for a duration of one week. Chlorine dioxide was injected into the chilled water at 3 ppm. The results were compared to a previous history when using chlorine at 75 ppm. Samples were taken daily, and averaged for the week and compared to the average for chlorine. As is evident there is no significant difference between the two chemicals. Food and Drug Administration amendment to 21 CFR Part 173 to provide for the safe use of chlorine dioxide as an antimicrobial agent in water used in poultry processing up to 3ppm. Directive 93/43/EEC states that water used in food production must be of quality for human consumption. This implements Council Directive 80/778/EEC on the quality of water for human consumption, where it relates to water used in food production, where chlorine dioxide is approved for use at 0.5 ppm (the washing of poultry and meat carcasses with 75 ppm of chlorine is no longer allowed, chlorine is only permitted for use at drinking water levels).